“Cinecitta Shows Off,” the new exhibit at Rome’s famous movie studios, isn’t the only way to delve into Rome’s cinematic past. 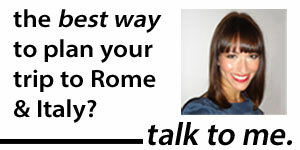 The other way: Simply walking around Rome. 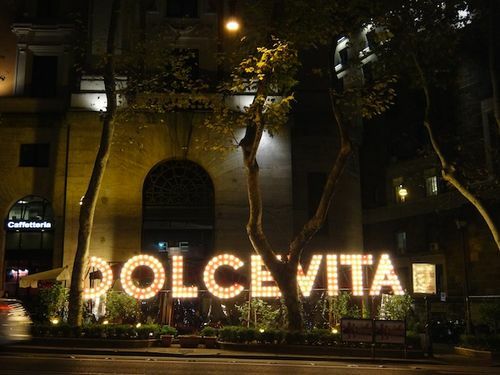 Many famous movies, including many of Fellini’s, were, of course, filmed here. Want to go on a cinema-themed walk? Here are some top stops. (Note: Obviously, I can’t take credit for any of these movie-still photos). Piazza del Popolo. The piazza is one of the first clues in Tom Hanks’ Angels & Demons . Spanish Steps. This staircase is so famous, it’s shown up in lots of films. 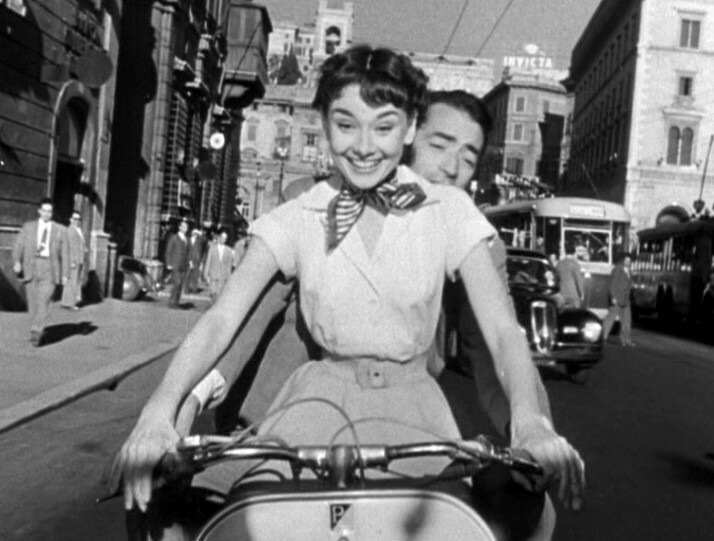 Some of the most famous, and most recent: Roman Holiday, where Hepburn enjoys her gelato, and The Talented Mr. Ripley , where Ripley arranges for Meredith, Marge and Peter Smith-Kingsley to meet (above). Via Margutta, near the Spanish Steps. Number 51 is where Audrey Hepburn spent that fateful night in Joe Bradley/Gregory Peck’s bed (without him — we’re talking 1953 here) in Roman Holiday. In real life, Fellini himself lived here at number 110. Via della Stamperia, near the Trevi Fountain. Here, at number 85, is where Audrey got her (oh-so-shocking!) 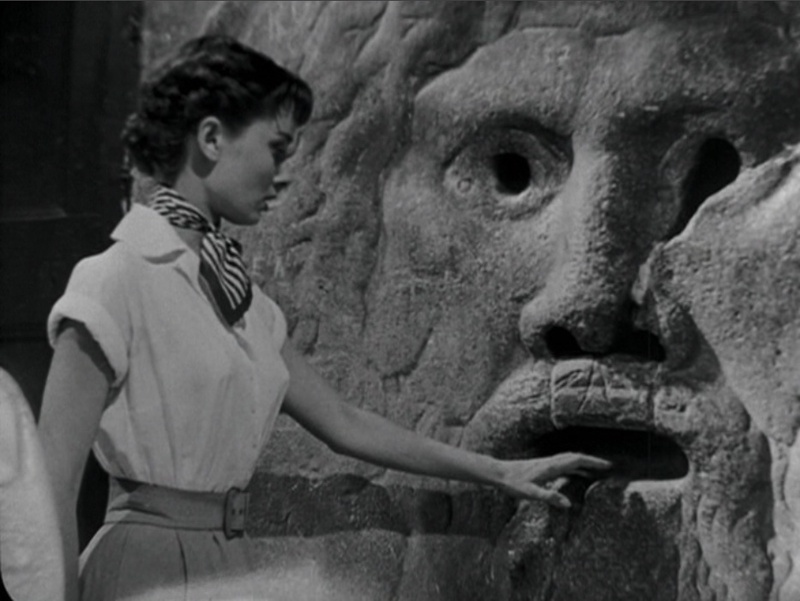 haircut in Roman Holiday. Trevi Fountain. It’s the location of one of the most famous scenes in Rome movie history: Anita Ekberg wading through the waters, getting Marcello Mastroianni to come join her, in Fellini’s 1960 blockbuster La Dolce Vita . (If you haven’t seen it, now’s your chance, above). Hepburn and Peck had a scene here, too. Via Veneto. The slick shopping street where Ekberg and Mastroianni meet, before driving to a castle, in La Dolce Vita. Pantheon. One of the pivotal clues for Tom Hank’s character in Angels and Demons; Hepburn and Peck come here, too. Via dei Fori Imperiali. Here’s where Hepburn passed out on a bench in one of Roman Holiday’s first scenes, only to be roused by Peck. At the nearby Forum Hotel’s rooftop bar, The American Bar, the characters from the 1991 rom-com Only You (played by Robert Downey, Jr. and Marisa Tomei) share a romantic dinner. Via dei Portoghesi. Here, at number 7, is where Julia Roberts stayed as Liz Gilbert in Eat Pray Love . At nearby Ristorante Santa Lucia (Largo Febo 12), Liz shows off her Italian to her friends by reeling off the Italian on the menu. Colosseum. Shots of the famous theater play a part in Roman Holiday, Eat Pray Love, Only You, and many others. “Mouth of Truth.” Here’s where Hepburn stuck her hand, much to her fear and delight, in Roman Holiday… a scene recreated in Only You nearly 40 years later. Castel Sant’Angelo. Where all the dancers fell into the water in Roman Holiday; the exterior was shot for Angels and Demons, too. St. Peter’s Basilica. Used in TThe Godfather Part III . 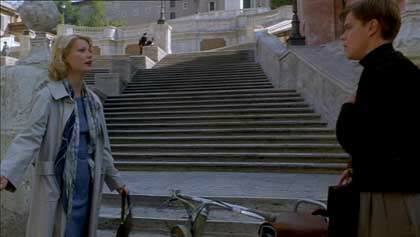 And the piazza was part of that pivotal last scene in that instant classic… Eurotrip . Santa Maria in Trastevere. The church here served as a backdrop in a pivotal romantic scene between Tomei and Downey, Jr. in Only You. The nearby Trastevere restaurant, Galeassi Ristorante, is where they eat. Porta Portese. Key scenes from Bicycle Thieves were filmed at this Sunday market in Trastevere. Also: the most idyllic island escapes from Rome, 11 etiquette mistakes not to make at an Italian meal and one of the loveliest little leather shops around. Until Nov. 30, Cinecittà Studios — the former haunt of everyone from Federico Fellini to Audrey Hepburn, Elizabeth Taylor to Roberto Rossellini — are open for visitors as part of the show "Cinecittà Si Mostra." I checked this out on the opening day for a story for Global Post, and the show is definitely cool. It's a neat chance to get a glimpse at the movie studio so legendary, it was called "Hollywood on the Tiber" — and that was the set for hundreds of movies, including Cleopatra, La Dolce Vita, War and Peace, Roman Holiday, Ben-Hur, and, more recently, Gangs of New York, Nine, Mission Impossible 3, and The Life Aquatic with Steve Zissou… to name a few. 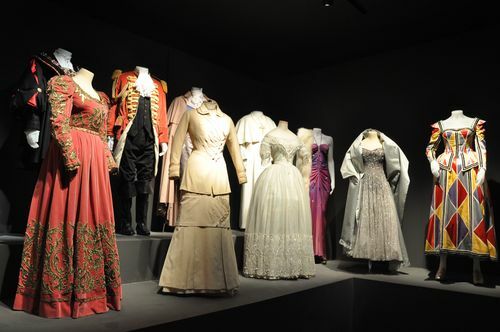 In one building, an exhibit has been set up that walks you through the making of a movie, from the costumes to set design to post-production. The downside? It's in Italian, and not super-elaborate. The upside? The items that are included. The costumes: Elizabeth Taylor's gold gown and intricate wig as Cleopatra, Sean Connery's habit as a friar in The Name of the Rose, the papal vestments worn for this year's Cannes-destined film Habemus Papum (latter two, shown above). 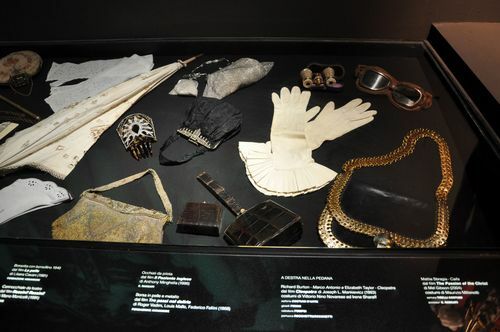 The accessories (below): Pilot's goggles from The English Patient, gladiator's armor from the HBO/BBC series Rome. The items from past sets, including the dolphin-shaped statue that marked the chariot laps in Ben-Hur and the throne from Cleopatra. And sketches of the set design for previous movies. 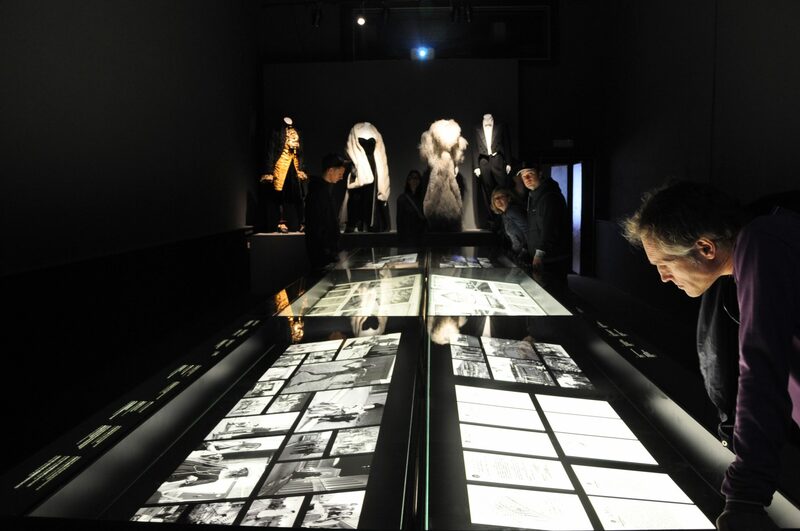 In the second building — the Palazzina Fellini, dedicated by the studios to the great director — more costumes (my favorites: the glittering white dress that Audrey Hepburn wore in the War and Peace posters, and the slinky velvet dress and fur stole donned by Anita Ekberg for La Dolce Vita, shown at top). More photographs. And, in the theater of the Palazzina, a film showing. (All, however, in Italian). The pièce de résistance of the exhibit, though, is the chance to peek at the sets themselves. A black Mercedes van scoops you up (at least, it was a Mercedes on the opening day!) 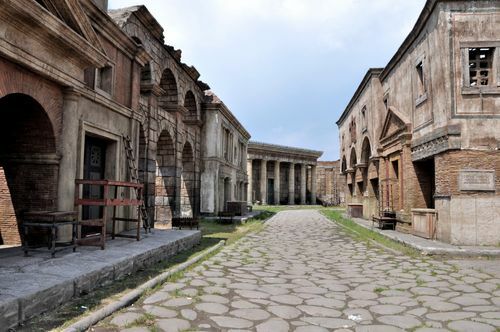 and takes you through a street designed for Martin Scorsese's Gangs of New York before plopping you in what can be best described as a whacked-out version of ancient Rome, designed for the television series (below). Here's a Rome where, true to historical authenticity, the temples were colorfully painted, graffiti splotched monuments, and tenement buildings ran several stories tall. Here, too, is a Rome where those buildings are fiberglass, the other side of a major temple is the city wall, and behind graffiti-splotched walls are… nothing. Ah, the tricks of the movie business. All in all, the show didn't have quite as much to offer as I thought, in terms of sheer exhibit space and items (although the items that were shown, like the costumes, were pretty cool). The Italian-only signs and movies might be frustrating for English speakers. 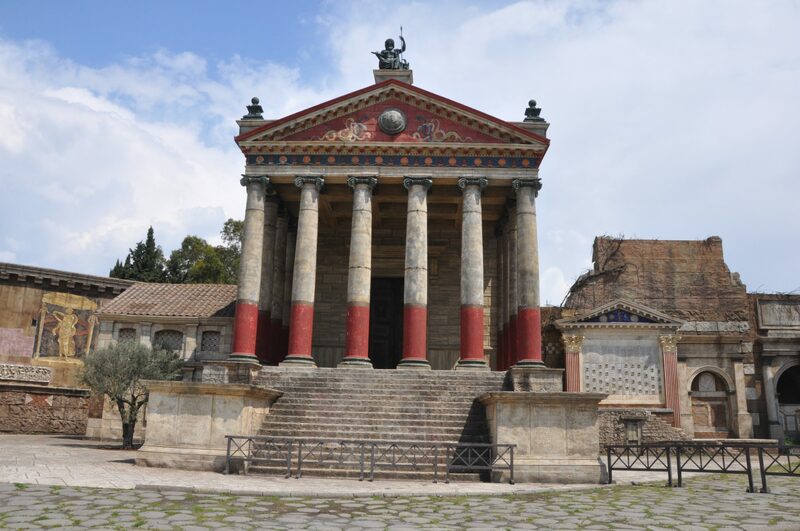 And even the set of ancient Rome could be a little disappointing: They say the set is 4 acres, but the part you're actually allowed to explore seems to be much smaller. 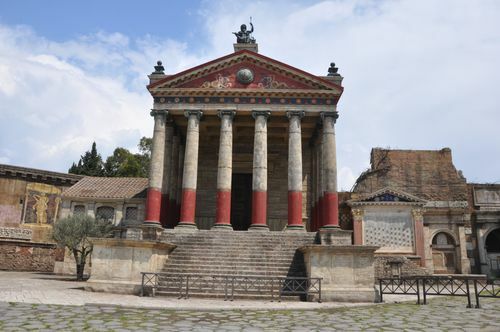 Still, if you're a movie buff or simply looking to do something a little different (or to walk through a version of ancient Rome, no matter how whacky it is), this is the place to come. 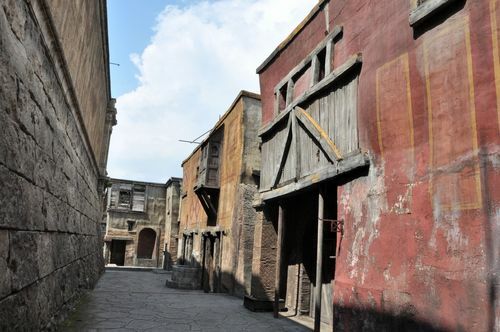 The Cinecittà Si Mostra exhibit runs until Nov. 30. Tickets cost €10; the studios, and exhibit entrance, are right at the Cinecittà metro stop (about a 25-minute ride from Termini). The exhibit is open daily from 10:30am-7:30pm, except Tuesdays (making it a good option on Monday, when all the other museums are closed!). And here's my Global Post article, for more on Cinecittà and on Rome's film industry.